For the last six years I’ve been privileged to hunt public lands Merriam’s turkeys in southwest Colorado’s San Juan Mountains with Colorado Backcountry Hunters & Anglers Habitat Watch volunteer Rick Hooley. Although Rick makes his living as a fly fishing outfitter/guide, he’s also a crack turkey and elk hunter. The author with a Marriam’s tom. Colorado has two subspecies of wild turkey—the Merriam’s, also known as the mountain turkey, and the Rio Grande, primarily found in eastern Colorado. Merriam’s are wanderers and frequent ponderosa pine forests. The Rio Grande prefer cottonwood trees along riparian areas. Colorado Parks & Wildlife (CPW) says Rio Grande turkeys are larger and easier to locate than Merriam’s, so hunting them is generally not as difficult. The spring snows continue to come but soon they will fade to the green leaves of a new season’s birth for Colorado. Turkey season is just a month away, and I find myself tuning calls, checking my old turkey vest and, at times, day dreaming about those gobbles at first light. The author displays a Merriam’s turkey he harvested in the San Juan Mountains. Colorado has two subspecies of wild turkey—the Merriam’s, also known as the mountain turkey, on the Western Slope and the Rio Grande on the Front Range. Turkeys are most often hunted during the spring, when their mating season occurs, with females laying a clutch of eight to twelve eggs that hatch in May. Just as bull elk are more vulnerable to human hunters during their fall rut/mating season, male wild turkeys (called toms or longbeards) become more susceptible to hunting in the spring. The tom is identifiable by hair-like feathers, called a beard, on its breast and red (white and blue) head. Colorado has spring and fall turkey hunting seasons. Be sure to check the current regulation brochure for season dates. 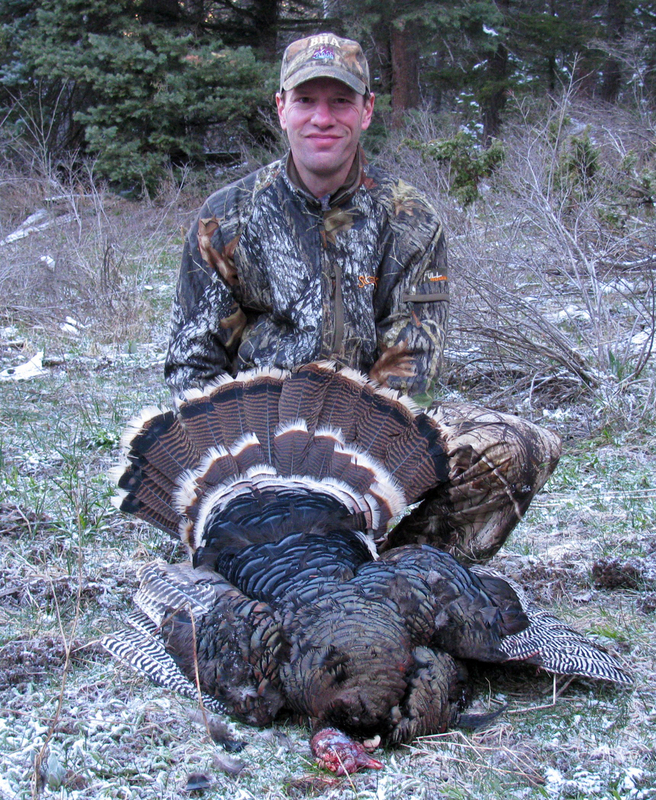 David Lien displays his Merriam’s turkey taken in southwest Colorado.